We saved our big gastronomic highlight for the French Riviera. We picked the restaurant at La Chevre d’Or, which is a 5 star boutique hotel and has a 2-star Michelin restaurant as well. The Chevre d’Or is located in the village of Eze, which is about 20 minutes east of Nice and is on the way to Monaco. 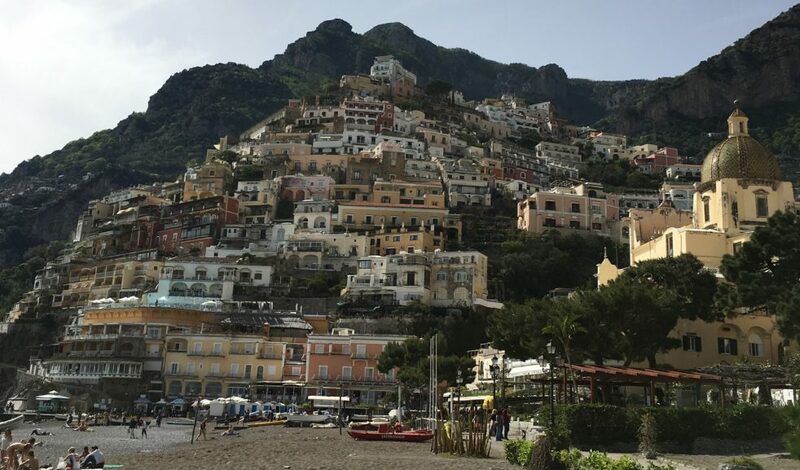 It’s an old stone village set on a cliff overlooking the Mediterranean so it has stunning views but does involve a lot of steps and climbing so it’s not good for people with mobility issues. You will do a lot of climbing if you visit Eze! Eze is an ancient city dating back to the middle ages and is sometimes referred to as an “eagle’s nest” because of its location on the cliff. It’s very picturesque so it’s an extremely popular day trip for tourists and can get very crowded. Steve and I were dressed up for our lunch (he was in jacket and tie) and it was quite hot and muggy this day so we didn’t climb up to see the entire village or the gardens at the very top but we did climb about half-way up during our visit and it’s very quaint. Lots of shops located in the town as well so plenty of good shopping. I wish we had more time to explore but we were focused on one thing this day – food! After walking around Eze for about 20 minutes, we decided to head to the Chevre d’Or for a pre-meal drink on their terrace, which I highly recommend doing. Also, if you don’t want to do the multi-course (and pricey) meal at the gastronomic restaurant, you can also have a more casual lunch on their terrace so don’t rule out this place because the views are worth it! Steve and I enjoyed one cocktail each before our reservation time. You do need reservations for the terrace as well because it’s very popular. After our drinks, we walked over to the restaurant. The chef is Arnaud Faye who spent time at the gourmet restaurants at the Ritz Hotel and the Mandarin Oriental in Paris. The restaurant focuses on local ingredients and wines and using the freshest and best quality ingredients available. After perusing the menu, we opted to splurge on the tasting menu and add in the wine pairings. We were there on a Sunday so we couldn’t do their smaller 3 course menu and our choices were a la carte or the 6 course menu. Figuring we may never get back here, we opted for the latter and were happy with our choice. The views from this restaurant are stunning. As the dining room is surrounded with huge picture windows, every table gets an amazing view and the dining room is filled with natural light. The meal started with multiple amuse bouches. They just kept coming! Our favorites were a cold gelled pistou soup and the foie gras mousse spheres but everything was delicious. I know the cold jellied soup sounds gross but it was incredible! Unfortunately it didn’t photograph well so I left it out of my pictures but all the others are shown below and described in the captions. Following multiple amuse bouches, we moved on to the main courses. We started with a pasta dish filled with rock shrimp and red berries, which was a really delicious and interesting flavor combination. It was paired with a lovely sauvignon blanc from the Rhone Valley. It didn’t photograph very well either as the shrimp were hidden under the pasta so it kind of looked like a white blob in my photo but it tasted great. We then moved on to the fish course, which was a baked Dentex fish with spinach raviolis and a saffron broth. I love fish and had never heard of Dentex so we looked it up – it’s a local fish found in the Mediterranean and it eats other fish and octopus (so it’s got some sharp teeth). It’s a clean, meaty white fish that I would say is similar in texture to monkfish or sea bass. Apparently they are very hard to catch so they are quite expensive and considered a real delicacy. We both thought it was delicious and agreed afterwards that it was the best course of the whole meal and probably the best piece of fish we have ever eaten! The raviolis were amazing as well. This course was paired with a chardonnay from Burgundy. Following this was the meat course – rabbit prepared 2 ways. A roasted piece of saddle wrapped in bacon and a piece of breast meat stuffed with mushrooms. It was served with tiny mushrooms, eggplant chips, au jus sauce and house made mustard. The meat was delicious as was the jus. It also had a small piece of octopus served with it, which we didn’t quite get. It didn’t go with the rest of the plate and was unnecessary so that was a little off but the rabbit itself was perfect. This course was served with a local syrah. We then moved onto dessert, which was a whole local fig roasted in a bed of rosemary and served with fresh figs, vanilla cream and mascarpone ice cream. I love figs so I thought this was marvelous and Steve enjoyed it was well. Very light and fresh. It was paired with a sweet dessert wine, which was lovely but sweet wines are not my thing. It was then followed by multiple amuse bouches of desserts. There were so many, I can’t remember them all but I know there was a small vanilla tartlet, a strawberry tartlet that liquified in your mouth as soon as you bit into it and, of course, a dense little chocolate bar. There were also mini macarons and cookies. I was getting overloaded by this point! We were stuffed by this point so we finished our various mignardises and sipped our last wine pairing while taking in the gorgeous view from our table. I really savored every bite here. The food was wonderful but I think the views made it even better. Lucky for us, we had beautiful weather as well. Steve was ready to call it day after this meal! Overall, this was my favorite meal of the whole trip. Steve thought it was a little frou-frou for his taste and preferred our lunch at La Sponda in Positano two years ago. Personally, I thought the food here was better and I enjoyed the views here even more but I will agree that La Sponda was more casual and laid-back. If you visit the French Riviera and want a special occasion meal, I highly recommend the Chevre d’Or. If you visit on any day other than a Sunday, you can also take advantage of their 3 course lunch for 90 euros (our 6 course lunch was 150 euros per person). Dinner here is even more expensive and I estimate would set you back by about $800 to $1,000 USD for a meal for two, depending on wine. It’s pricey but I felt it was worth it. Also, if you don’t want a super fancy lunch, I would recommend eating on their terrace, which is more casual and serves pizzas and salads as well as fresh seafood and steaks. I would definitely at least come here for a drink if you visit Eze!